Yesterday, I made good a promise to visit the BBA where I was the guest of Alan Thomas, the Sales & Communications Director, a stalwart of 25 years standing and, for many, the public face of the BBA. The BBA is the largest and most important of our Third Party Accreditation bodies. It began life in 1966 (as the Agrément Board), a time when a lot of new (mostly plastic) materials were appearing in the construction industry and there was a perceived need to establish which of them were fit for purpose. It changed name to the British Board of Agrément in 1982 and today employs around 140 people, based at the same site near Watford that plays host to the BRE. • Relations between the BRE and the BBA have never been as close as was originally envisaged when they came to share the same site. They got distinctly frosty a few years back when the BRE bought WIMLAS, Wimpey’s accreditation body, and began offering a rival service. But recently, the BRE have chosen to pull out of this market and to concentrate on other things, so perhaps a thaw can take place. • One of the things that Alan was keen to talk about was the Microgeneration Certification Scheme (MCS) which underpins the Feed-in-Tariffs and the Renewable Heat Incentive. It’s being run by Gemserv and, by all accounts, it’s becoming a bit of a rubber-stamping exercise, as there is so much kit out there that it is simply impossible to test it all thoroughly. • As well as microgeneration kit, they are currently testing dozens of new insulation materials. 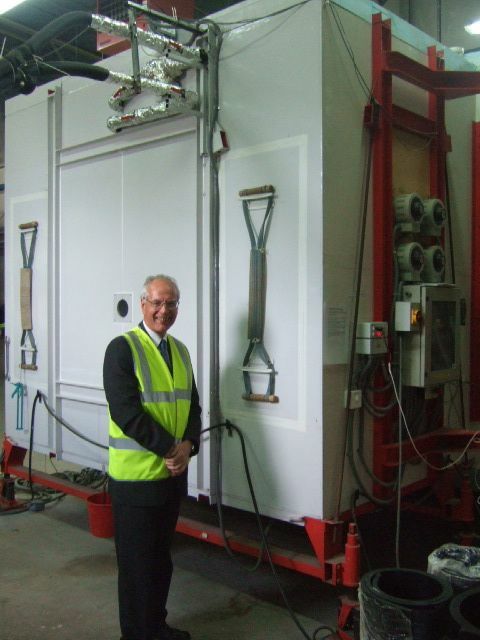 The BBA are one of only two places in the UK with a guarded hot box (the other is the National Physical Laboratory) and they are able to test the U value claims of various materials using it. Here is Alan Thomas pictured outside one of the BBA hot boxes. But U values are but one aspect of the tests. For instance, sheep’s wool has to be tested to see if it’s insect repellent and whether it reacts with metal fasteners which it might come into contact with. • There seems to be a marked reluctance for window manufacturers to use the hot box testing to evaluate thermal performance. Most windows coming onto the market today in the UK publish performance U values which are therefore untested. Contrast this with Germany and Austria where testing is far more common. “There are 8 hot boxes in Vienna alone,” I was told. Sounds like a great opening line for a new Katie Melua song. • Harmonised European testing remains as far away as ever. I must admit I quickly got lost in the alphabet-soup of CE markings, EOTA and ETA and BS EN nos. In theory, we should be getting pan-European standards, but in practice it seems that the member states have a long way to go to agree on this and it only applies to a very few areas so far. • Which brings us onto another issue, Technical Barriers to Trade. Or to put it another way, is all this testing and certification there to protect consumers, or to create expensive obstacles for foreign competitors? This came to the fore recently when the revision to Part G of the building regs was held up for several months because a number of cylinder makers felt that the safety requirements being introduced were in excess of anything called for elsewhere in the EC, and the government was challenged in the European courts over this. Our govt won the day and now we have some very restrictive safety requirements for our cylinders (look at G3). To be fair to the BBA, it’s an argument that they can’t win, as every safety inspection ever made could be said to be a “restraint of trade” by someone or other. All they can do is to carry on testing as well as they can, and hope that both manufacturers and consumers value their acumen. • I asked Alan if the BBA had ever been successfully sued. His brow furrowed a little and he sucked his teeth and thought about it, and then replied thus: “It’s not a question I’ve been asked before but I think I can honestly say that we haven’t.” I must admit to being rather impressed at this point. He added that they didn’t exactly want to crow about it because to do so would be to invite some litigious sole to take them on, but even so it does rather suggest that they may be quite good at what they claim to be doing. • And the BBA is not short of customers. They currently certify something like 1300 products and charge anywhere from £10k to £50k for approvals, which take anywhere from 3 months to 15 months to research and test. A BBA Certificate provides a route to market for manufacturers which might otherwise prove difficult: a building inspector or an insurance company will happily play ball with a BBA-approved product or system, whereas they may baulk at allowing something new and untested. Which is exactly what the idea was in the first place, back in 1966 when it all started. • What’s just as interesting is that many companies succeed with new products without getting BBA approval (or any other 3rd party accreditation). There is no compulsion to get innovative products certified so it becomes a purely commercial decision for them. They have to weigh up whether the widely recognised acceptability of a BBA certificate is worth the time and expense. Some very well known names do: others don’t. Subject for further investigation, methinks. • I asked at what point do products become so accepted that they no longer require certification. There is no hard and fast answer to this but Alan pointed out that, back in the 60s, timber frame was seen as so new that many manufacturers sought accreditation. Today, it’s become generally accepted. We discussed whether the same might happen with SIPS: Alan thought it might, but not yet, as the systems available all appear to be subtly different. He also suggested that many SIPS manufacturers were investigating whether to switch away from OSB to using Magnesium Oxide boards instead. • The multifoil debate still bubbles away in the background. There is no doubt that TRADA’s approval of Actis, back in 1997 (was it really that long ago?) remains controversial and damaging to the whole certification business because it involved a very public falling out over how products should be assessed. The BBA has sided with the hot-box theorists (aka the BR 443 establishment viewpoint) and won’t approve multifoils for use on their own – though it accepts an increasing number to be used in conjunction with more conventional insulation products, and there was plenty of evidence of multifoils going through the testing processes at their labs. • You can search for current BBA certificates here. Whilst we watch on in fascination, all wondering what living with a hung parliament will be like, this election is remarkable for how underwhelming the various manifestos actually are. The arguments go round and round but somehow none of the really big issues facing us gets a look in. None more so than man-made climate change, of course. No hint of any new carbon taxes, let alone anything like personal carbon rationing. But with more than half the electorate now disbelieving the evidence that global warming is even happening, what hope is there for democracy as a credible system of government? Yes, it would involve new taxes. Yes, it would stifle economic growth. Yes, it would tend to make us uncompetitive with countries where no action gets taken. But then so do many other things that we already provide, and other countries don’t. I’m talking pensions, and benefits and free health care, and free(ish) education. • Why do we continue to support old people long past their sell-by date? They contribute nothing to the national wealth, so why not let them fend for themselves? Winter fuel allowance? Humbug. • Why pay money to anyone just because they are not earning? Have we gone completely soft in the head? I’m bloody sure they don’t do that in China. • Why have a national health service at all? Don’t we all know we are going to die sooner or later, and the sooner we get on with it, the more competitive as a nation we will become. • Why spend billions teaching kids useless stuff like history and Shakespeare? Get ‘em to read and write and then let ‘em get on with it. Universities? Who needs them! Now all this really would be a trip back into the early 19th century for us — as I am sure one or two Anonymouses will point out — but I can’t be alone in thinking that that’s exactly where we will be heading if we don’t get to grip with our compulsive carbon addiction. All our wealth and so-called sophistication is rooted in burning fossil-fuels, and it’s going to have to end remarkably soon, but nowhere will you find any discussion of this in the various manifestoes. We are facing the biggest challenge to our way of life since Hitler and the Fascists around Europe threatened invasion, but you just wouldn’t know it from this election. Can you imagine an election being held in 1938 and no one mentioning Hitler? That’s what it’s like. Even the Green Party manifesto is peculiarly light on this topic – no mention any form of carbon rationing, just a bit of tinkering about with what is there. The weekend of May 15-16 will see me in Glasgow at the Homebuilding & Renovating Scottish show where I will be taking part in three seminars daily, as well as manning the Ask The Experts stand at other times. I know it sounds a little trite, but it is always a pleasure to present in Scotland because the audience is rather different to the English ones we encounter elsewhere, and the projects are often just that little bit more unusual. I particularly like people who are venturing out into the Highlands with dreams of making it all happen far from the madding crowd. But down at the other end of the country, at the National SelfBuild & Renovation Centre in Swindon, there is another interesting event happening over the same weekend, which is the Affordable Selfbuild Weekend, something I have been banging on about for 15 years now, so an event which has my full support. With the newbuild house market still in disarray after the shenanigans of the credit crunch, it’s good to see that selfbuild in general is still thriving and that this Back-to-Basics style of selfbuild is modish once more. I’m currently updating my book, something I do every couple of years or so. It involves reading quietly through the 250,000 odd words of the text and making a few additions, deletions and amendments. I’m currently buried in the section on floor coverings and it starts out with an overview of carpets. As I am reading it, it strikes me that almost no one fits carpets anymore. They have gone right out of fashion, ditched in favour of hardwood and tiles. Yet the best material for carpet is…..sheep’s wool. Use sheep’s wool as an insulation material, and you’ll be a trend-setter. But put it on your floor, and you’ll be seen as some sort of weird throwback to the 1970s. Why? It’s not just carpet. What about cork tiles? I use to love cork tiles and I fitted dozens of Wicanders Cork-o-Plast floors in the 1980s in various kitchens and bathrooms. But when was the last time you saw someone laying a cork tile floor? Or even saw a cork tile for sale? They are right out of fashion and yet cork is a natural and wholly sustainable material, just like sheep’s wool. And timber? Everybodies’ favourite sustainable material, surely? Well, only in the right location, it would seem. 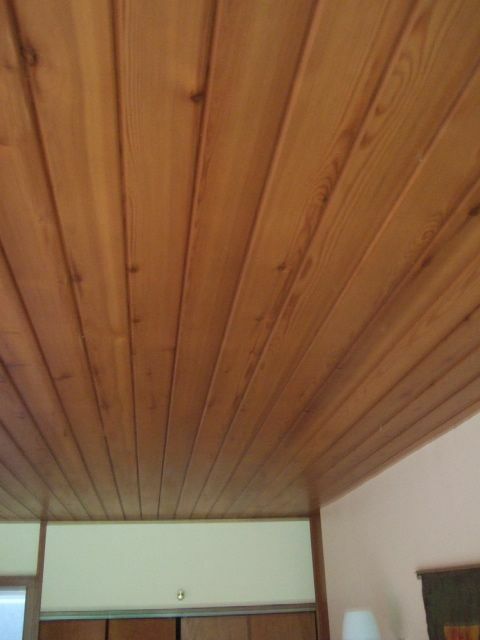 Untreated timber boarding is everywhere on the outside of new homes but almost completely absent from the interiors. Back in the 80s, it was the other way around. Matchboarded walls and ceilings (here's one I viewed this morning!) were de rigueur in fashionable bathrooms and loft conversions. But now they all look just so dated. How strange is that? So whilst we might think that we live in an era when natural and sustainable materials are the height of fashion, on closer inspection it seems to me that it’s all much more about fashion for the sake of fashion, and that sustainable logic has little to do with it. But then again, I used to covet coloured bathroom suites. Not everything in the past was rosy. Somethings were avocado. There are still known to be one or two teething troubles with the collectors and conventional meters have so far been unable to record the power output, but the BRE are thought to be working on an “adaptive meter” which will be able to cope with this. In the meantime, the plan is for the output to be “deemed” so as not to put off early adopters.